I think it’s fair to say that most of us know roughly what clinical governance is, as we all do audit and the Quality Improvement Project is an extension of this. 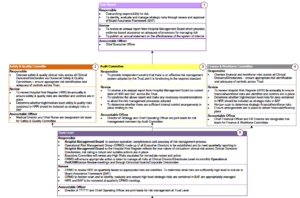 There are other aspects of Clinical Governance however – it basically encompasses how we run a safe, happy department. There are 7 areas listed below (when I get more tech savvy I might be able to do some fancy graphics). 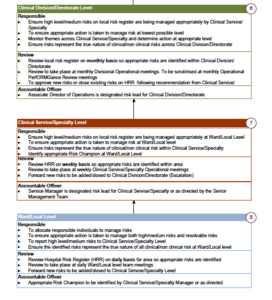 In the case of locums, 1-3 and 5&6 may already have been done adequately by the agency – if the agency has signed up to NHS employers checklist. However ultimately the trust is liable if there is an issue so we should check these checks have been made also. It is important that 4 is done adequately by the ED – usually CVs are vetted by consultants or SAS drs. I have no specific examples of this – maybe post below if you know of any examples of good practice? We all know about audit – a system of examining what we are doing against recommended practice, making changes and re-examining. informed monthly about unresolved high risks, significant risks, new risks, overdue risks and risks to be reviewed. Usually not the responsibility of any clinicians or nurses, although the clinical team may have responsibility for training on the use of equipment or issuing passwords. If a new piece of equipment is brought in, it’s important to ensure that training sessions are organised. If access to blood results, radiology is a problem, often temporary password ‘packs’ can be obtained from IT to be left for locums. Locums: have a responsible officer as part of their agency who is responsible for ensuring they are up to date.